Power up your profits by combining these formations. Traders who use the candlestick technique say to take notice when a doji* appears. The doji is one of the most revealing signals in candlestick analysis, and clearly indicates when the bulls and bears are at equilibrium or in a state of indecision. A doji that appears after the bulk of an extended trend may signal the end of the trend. This alert alone creates a multitude of investment opportunities. A rule among candlestick traders is to sell immediately when a doji appears at the top of a trend in an overbought area. Conversely, a doji at the bottom of an extended downtrend requires buying signals the next day to confirm the reversal. Otherwise, the weight of the market could take the trend lower. There is an additional important element: the strength of the new move. The appearance of a gap is an indication that a strong trend is beginning. Gaps (ku) are also referred to as windows (mado) in candlestick analysis. A gap or window reveals powerful, high-profit trades and, when correlated with candlestick signals, provides valuable profit-making setups. Gap patterns are an important aspect of Japanese candlestick analysis; in fact, some traders make a living trading strictly off gaps. In a rising market, gaps occur when prices open higher than any part of the previous day's trading range. What does this mean in terms of trader sentiment? During the off-market hours, the stock somehow became more desirable, so the next day the price opened well above the prior day's candlestick body and even above the high of the previous day's trading range. The same is true for a bearish indication, gapping down from the previous range. Note the space between the high of the previous day and the low of the following day in Figure 1. Figure 1: Gap up. Notice how the low is higher than the high of the previous trading day. A gap or window that forms at the beginning of a trend reveals that as the direction reverses, buyers step in with great zeal. For example, suppose that a doji appears during a prolonged downtrend, indicating that selling may have stopped. To verify that the downtrend is indeed ending, there must be an indication of buying on the following trading day. Buying will be most pronounced if prices gap up the following trading day. The appearance of a gap warns not only that the trend is going to change, but also that the new trend is going to be strong because of the enthusiasm among traders trying to get into the stock at that price. In such a scenario, the gap is seen as a strength indicator. While many investors are apprehensive about buying a stock that has gapped up from the previous day's close, this is not a concern for the candlestick trader. A candlestick buy signal in the form of a doji prior to the gap up provides a basis for aggressively buying the stock. If it is at the bottom of a trend, that 5% initial move may just be the beginning of a 25% move, or even a major trend that might last for months. Obviously, a potential candlestick buy signal at the bottom of an extended downtrend is a great place to buy. Further, buying stocks that are already oversold reduces your downside risk. And when you see that buyers are anxious to get into the stock, the opportunity is even better. The chart of Cross Media Marketing (XMM) displayed in Figure 2 shows how powerful the doji/gap combination is. I have used the stochastic oscillator to identify overbought/oversold conditions. When the stochastics level is below 20 the stock is considered oversold, and when the level is above 80 the stock is considered overbought. Note the stochastics levels after the doji/haramis on November 5 and December 18, 2001. Although the gaps up clearly indicated each trend had reversed, the stochastic indicator acted as additional confirmation to suggest a rise in the trends. Figure 2: Dojis and gaps at bottom. A doji followed by a gap up indicates a forming uptrend. A doji at the top of a sustained trend warrants immediate liquidation. That becomes more evident if the prices gap down the next day. On the chart displayed in Figure 3 of Integrated Silicon Solutions (ISSI), the doji at the top with stochastics in the overbought area would have been the warning. If you were long, you would liquidate at the first sign of a weaker open upon seeing the doji. The gap down the next day should have been more than enough to convince you that the sellers had stepped in. Figure 3: Doji and gap at the top. A doji at the top followed by a gap down, together with stochastics showing overbought levels, gives a strong sell signal. Hundreds of years of profitable observations have identified the doji as a prime reversal signal. Gaps have been repeatedly demonstrated as the driving force of trend direction. The combination of candlestick signals and gaps creates one of the most powerful investment tools found in technical analysis. As a trader you must look for patterns that put the probabilities in your favor, and this is one combination that can do it for you. 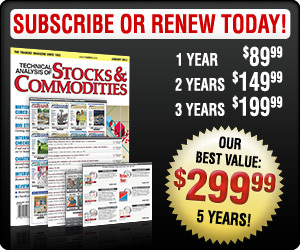 Stephen W. Bigalow is the author of Profitable Candlestick Trading and the principal of www.candlestickforum.com. *See our online cumulative glossary. Stephen W. Bigalow is an author and the principal of the www.candlestickforum.com, a website for providing information and educational material about candlestick investing.